He can trace the botanical origins of a food product, such as wine or tequila or apple juice, and determine whether the manufacturer’s list of ingredients on the box or bottle is true. …10 per cent of all food is not what it claims to be. The article doesn’t really get into the details of the research spending more time talking about the departments grants and possibilities of commercialization. But I thought I’d put the link up as a good reminder of what food scientists are doing with respect to provenance. After my post on Saturday about chinese food, merpel pointed out to me that the new issue of Wired has an entire issue devoted to the future of food. 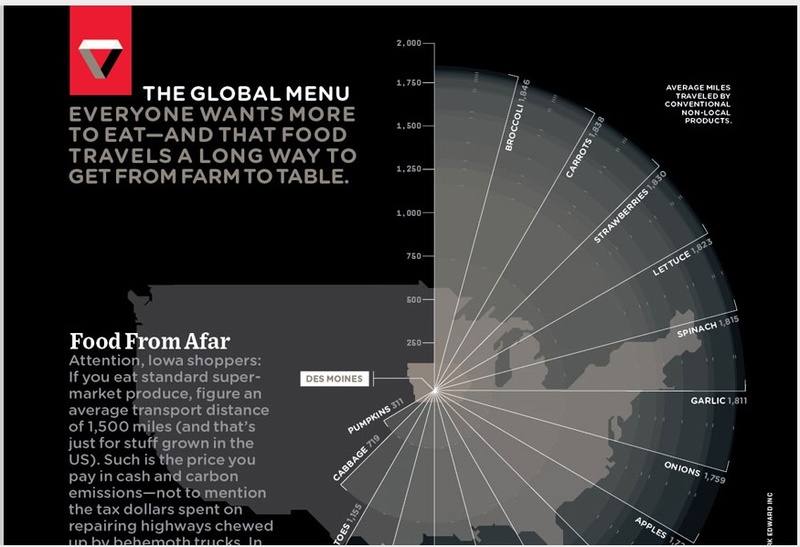 Of particular interest is the infographic shown above The Global Menu: Food from Afar that displays the distance that food has to travel to get to Iowa, which is some how apropos because I have roots there. It’s just amazing to me that in a place with such great soil where anything can grow apples are shipped in from 1726 miles away! I mean my grandmother who lives in Iowa has an orchard out back so its definitely possible…. Here in California, I think it’s one of the reasons that Proposition 2 (a ballot initiative to regulate the confinement of animals) has a good chance of passing (72% in favor: Survey USA poll Sept.). People are beginning to care about how their food is produced and in this case how animals are treated before they make it to the dinner plate. There was a great piece in this past Sunday’s New York Times Sunday Magazine (The Barnyard Strategist) about Proposition 2 and the man behind the initiative, Wayne Pacelle, the director of the Humane Society. The real price of takeout…. Steven Shaw has an op-ed in the NY Times about the extremely poor working conditions and pay for chinese food delivery in New York. I haven’t had takeout chinese delivered since I’ve moved to LA but I’m pretty sure its the same here. It’s interesting to note that it’s difficult for consumers to be aware of what the true price of convenience is. If you don’t know Paul Krugman, he’s a Princeton economist and probably, until recently when he won the Nobel Prize in economics, most famous for writing a column in the New York Times. I was lucky enough to be able watch him give a talk last night at Rand as part of a series of talks organized by a non-profit called Zócolo. I’m quite chuffed with myself because I reserved tickets for the event before he was awarded the Nobel. The organizers had been sending email all week telling people to get there early because there was quite a bit of demand. When my friend and I got there (over an hour early) there was already a pretty long queue for any unclaimed seats and a bit of a queue for the reserved seats. We got in no problem but it sounds like quite a few people got turned away. He described the housing bubble as people thinking “the old rules no longer applied to things like buildings!” in a comparison to the 1990s internet bubble which at least had a dramatic technology shift to justify the claims that the rules (prices can fall) no longer applied. In terms of the shadow banking system, it was shocking how big it has gotten, roughly the same size ($10 trillon) as the assets of normal banks. A point that I’d like to remember is his definition of a bank as “anything that borrows short and lends long”. Stabilize the financial sector through the government taking over/investing directly in financial firms. Global regulation of the shadow banking system. Finally, he discussed politics (republicans are out of policy ideas) and did a fairly long QA. Unfortunately, I didn’t get to ask my question about whether he thought having an audit trail or knowing the provenance of mortgage backed securities would have helped lessened the impact of housing bubble popping. Krugman’s talk really brought home how interconnected we are. He discussed how economists just weeks ago were thinking that developing world countries were safer than developed countries because they were “decoupled”, which turns out not to be true. Just in the past couple of days these countries have begun to get hit by this crisis. Essentially, “A collapse in the price of condos in San Diego can bankrupt Iceland”. Investors are invested everywhere, we are “awesomely globalized”. It was a great evening very intellectually stimulating without being to heavy (Krugman: “…maybe McCain will rediscover his maverisity”). The speech was recorded and I’ll post the podcast when its made available by the organizers. 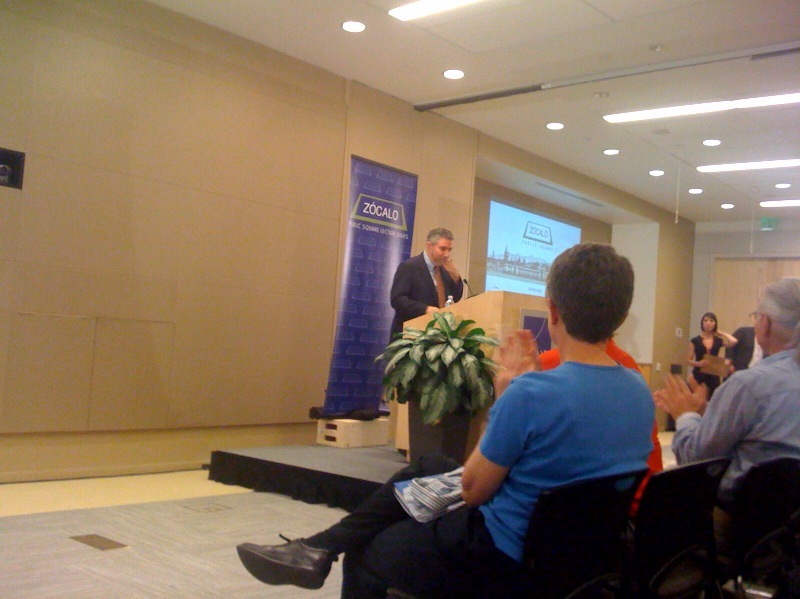 Update: You can listen to the podcast of Krugman’s talk here. Noah Gray discusses the issue of how to determine who did what in a multiple author paper. He brings up one suggestion by Dr. Cagan Sekercioglu to quantify the contribution of each author. I agree with Gray that this sort of quantification probably doesn’t help much. I actually never knew that Nature has had an optional author contributions section. I think that’s pretty cool. I do think it would be nice to have a graphical depiction of what people did to get a quick grasp of their role. For example, he acted as a programmer, or she came up with the experimental design…. maybe some nice icons would do the trick…. I recommend checking out the post. I just saw an interesting post in the New York Times’ Green Inc. blog about how an Indian state controlled firm (with a consortium of other investors) is trying to acquire coal mines in appalachia. It’s a powerful example of how the software delivered from Bangalore may be powered by coal from West Virginia. It brings up the interesting question of how can individuals lock in the sources of their stuff without the purchasing power of a corporation. Think Links is both a blog and a project. As with all good projects, hopefully, this one will change and evolve over time. However, to start out I thought it would be good to put down the initial objectives and rough process of the project. A manifesto so to speak. As stated in the tagline for the blog, this is project is about provenance: the origins of stuff; where it came from, how it was produced, what are its component parts. In this age of globalization, its increasingly difficult to figure this out and its increasingly important. Provenance help us determine the quality of the stuff we use whether it is the vegetables we eat or the web pages we read. And to be honest, Made In China doesn’t help. To sum up, the aim is to think about the links back to the sources of our stuff. The process I plan to take is to be as open as serendipitous as I can be…. to have fun with it. I imagine that posts will range from interviews with people, to reviews of recent academic literature, to links to cool and effective design. I’m of the opinion that understanding the origins of things is a fundamental idea and thus, this project can range widely while still coalescing around the central aims above. Hopefully, this project can do its small part to promote the production of quality by making people aware of provenance. Finally, please feel free to comment, send me suggestions, or provide a guest post.